Music festival season is somewhat unavoidable on social media. Photos of wild outfits and videos of concert sets infiltrate our newsfeed – and these pictures and videos sometimes include substance use. According to Billboard, 32 million people in the U.S. go to at least one music festival each year. In Europe, at least 1 in 7 people attended a dance music event in 2015. For attendees, it’s an opportunity to disconnect from daily life and let loose. What people do to let loose varies, though. 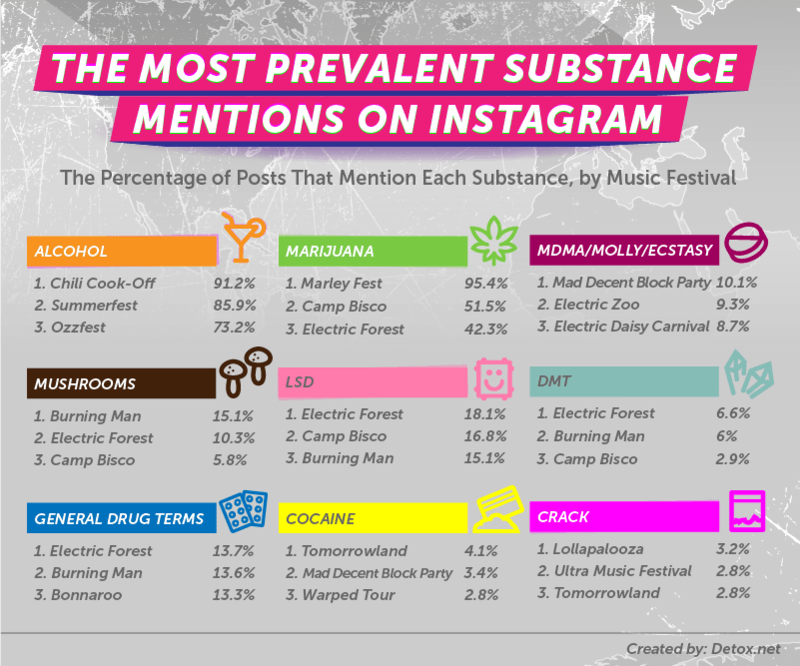 We scraped Instagram posts from popular music festivals in the past two years, tracking the most documented substances. Despite some festival policies prohibiting substance use, there is no doubt many attendees are participating in this unsanctioned activity. Continue reading to see what we learned. 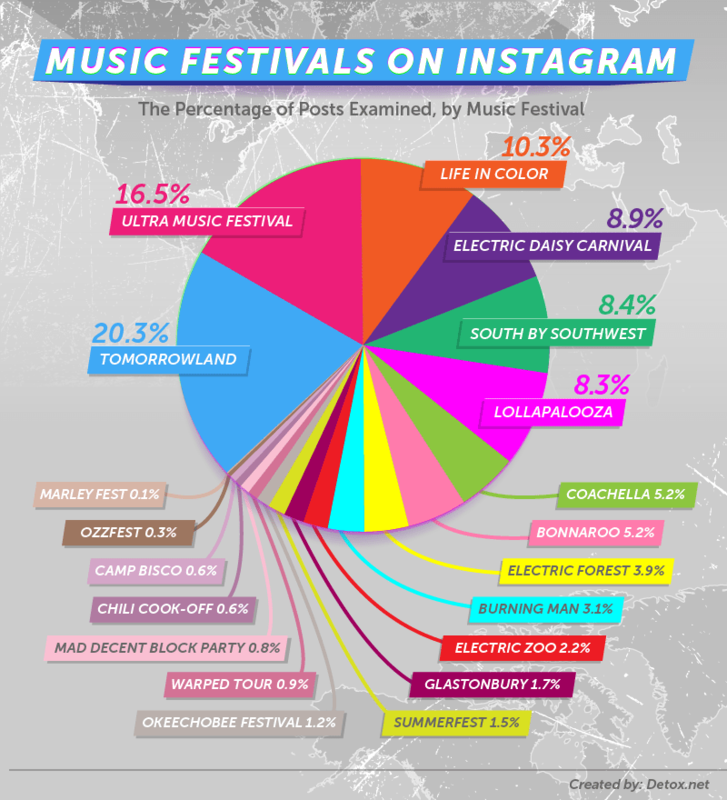 Tomorrowland made up 20.3 percent of all festival posts examined on Instagram. The electronic music festival, which takes place over two weekends, sold out its Belgian tickets in just 40 minutes in 2016. Ultra Music Festival made up the second most posts, with 16.5 percent of posts taking place at the Miami music festival. Ultra celebrated its 19th anniversary this past March with 165,000 attendees from over 60 countries, earning more than 42 million social media mentions. When analyzing concert and festival Instagram posts, we looked for any mentions of drugs and alcohol. 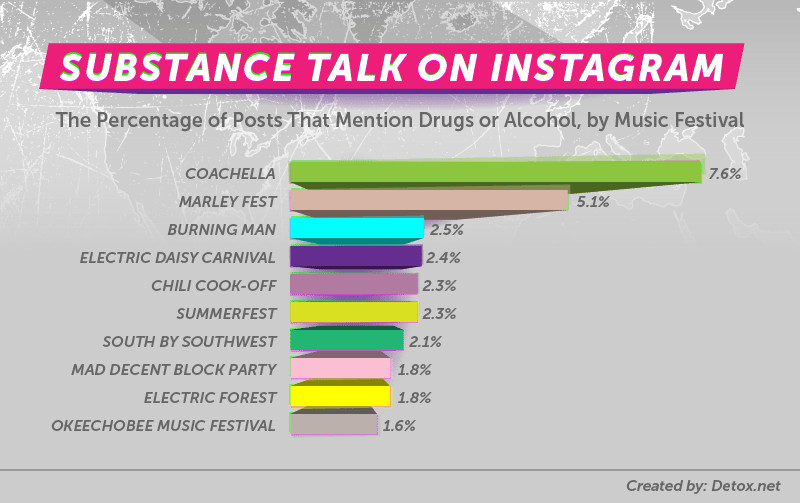 Coachella had the most drug and alcohol mentions, with 7.6 percent of posts referring to some substance. Although the festival forbids drugs, including marijuana prescribed with a medical card, other events near the festival feature a large assortment of cannabis-inspired products. In this graphic, we can see a breakdown of substance mentions on Instagram. Alcohol and marijuana were, by far, referenced more often than any other substance at each music festival. LSD is known to produce symptoms similar to psychosis, which usually last between six and 10 hours, although taking too much LSD can lead to terrifying hallucinations. Physical side effects may also include increased blood pressure, elevated body temperature, dizziness, and excessive sweating, which can prove increasingly harmful. MDMA can also be life-threatening. In fact, two people died at the Sunset Music Festival in Tampa in 2016 after “accidental drug abuse.” Victims of People who overdose on MDMA may also experience heat stroke because the drug cloaks the need for food, water, and res, which could ultimately result in deadly dehydration and exhaustion. Additionally, Summerfest and Chili Cook-Off had the highest percentage of alcohol mentions (nearly 86 percent and over 91 percent, respectively). Alcohol was most prevalent in substance-related posts from the Chili Cook-Off (91.2 percent), Summerfest (85.9 percent), and Ozzfest (73.2 percent). Unlike most other music festivals, the lineups for these three festivals are comprised of rock and country bands. Marley Fest, a reggae music festival, had the most marijuana references at over 95 percent. Following Marley Fest was Camp Bisco, where 51.5 percent of Instagram posts referred to marijuana in some capacity. Aside from the physical repercussions of marijuana, people should also be wary of sharing photos of the drug. According to social media strategist Shannon Self, “A photograph of someone smoking weed documents a possession felony,” which in Arizona can result in a $150,000 fine and an 18-month jail sentence. Just over 15 percent of Instagram substance-related posts at Burning Man mentioned mushrooms, which contain the compound psilocybin. Burning Man also had prevalent mentions of LSD, DMT, and general drug terms. 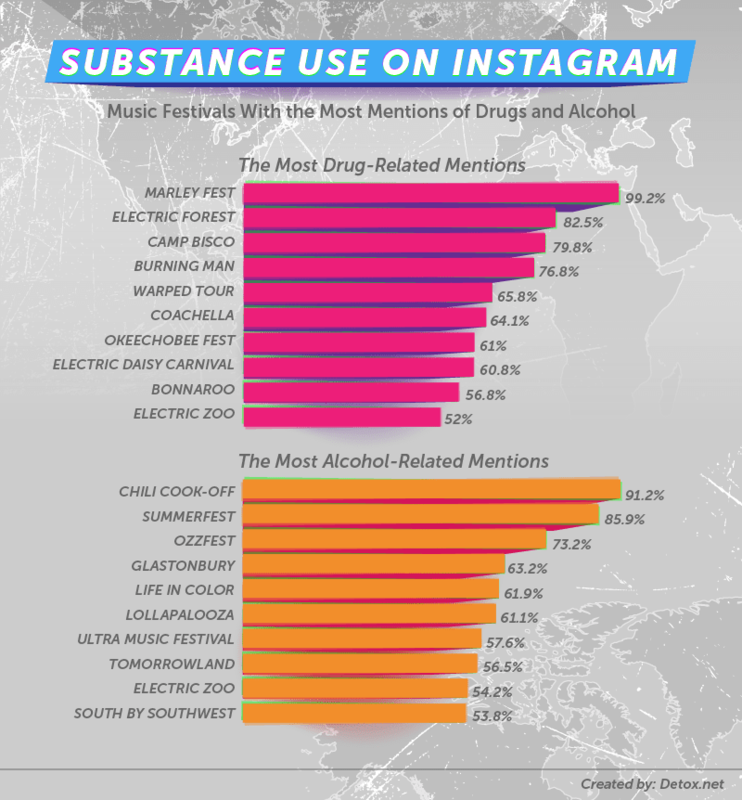 Looking at the music festivals with the most mentions of drugs and alcohol, Marley Fest had the most drug-related mentions (99.2 percent), while the Chili Cook-Off had the most alcohol-related mentions on Instagram. 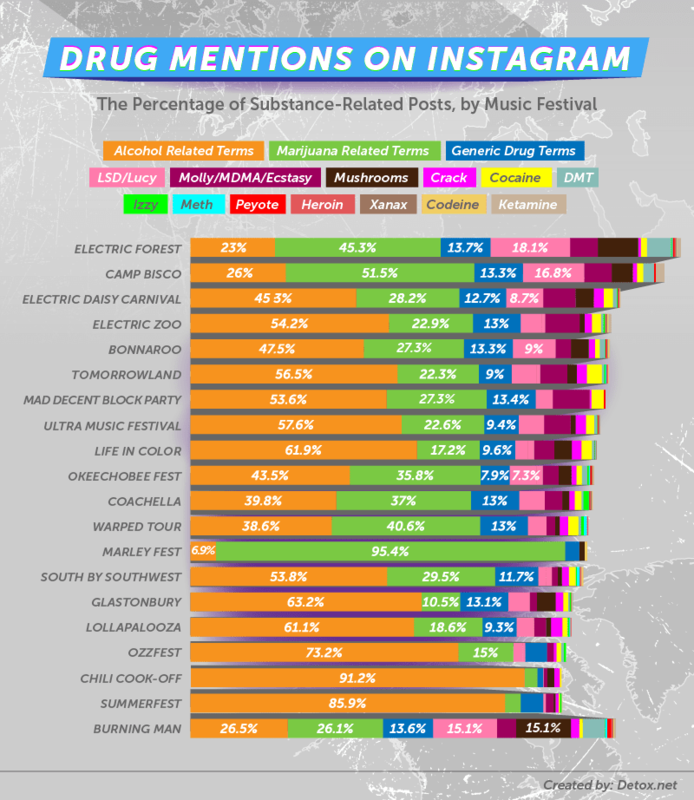 However, Instagram posts about the Electric Zoo festival most mentioned both drugs and alcohol (52 percent and 54.2 percent, respectively). Music festivals are a fun opportunity to see great bands, make friends, and have memorable experiences, but what’s most important is that you stay safe. Being in a new place, surrounded by thousands of strangers in a hot climate can heighten the effects of drugs and lead to dehydration and overheating. It’s unfortunate there has been a strong history of drug overdoses at music festivals, but there are steps festivalgoers can take to stay safe – and most importantly – alive. There are several resources available to stay sober during festivals. Harmonium is an organization that was established in 2002 at Bonnaroo. This group volunteers at most music festivals, including Lollapalooza, EDC, the Governors Ball, and Bonnaroo. Harmonium helps festivalgoers, either in recovery or just anyone trying to remain sober – by providing them a safe space to enjoy the festival without the presence of any substances. Whether at a festival or at home, it’s important to seek help for alcohol and substance use and misuse. If you or someone you know is battling alcohol or substance addiction, Detox.net can help. With varied treatment options to increase each individual’s chances of success, you’ll get the assistance you need to overcome dependency. Start taking your life back for yourself and your family. We used Instagram hashtags to gather posts from popular festivals and analyzed these posts for substance mentions or substance-related mentions. We searched for 49 hashtags related to music festivals. Once we collected the posts from March 2015 through February 2017, we looked for mentions of these substances and related terms within captions. We then looked through the Instagram posts collected and tried to remove ones that did not pertain to substances. For the purpose of this project, we only examined festivals that had at least 100 substance mentions. This is a social scrape and, as such, we can not be certain that every single post here is drug-related. In addition, we are not suggesting people at these music festivals are using substances. Rather, we take them for what they are: social media posts. We use this as an opportunity to talk about the potential dangers of drug use.